The sneaker is a durable iteration of Vans, and a couple of users insisted that it still looks like brand new after four months of wear. The Vans UltraRange Rapidweld has uncontested comfort that was strongly testified by more than 90% of the reviewers. Most users utilize the sneaker as everyday foot apparel. It boasts more improved freedom of motion, compared to other Vans shoes like Old Skools. Many wearers highly commend the sneaker's exceptional grip even in outrageous surfaces which gives them confidence on every stride. The inclusion of mesh in its panels prevents the foot from overheating during intense activities and encourages breathability. The sneaker is perfect for people who are always on-the-go, and a user even wears it for parkour and acrobatics. The upper doesn't show crease marks with continued use, others noted. The sneaker's black colorway can double as a dress shoe on several occasions. The Vans UltraRange Rapidweld can be worn straight out of the box with or without socks and requires zero break-ins. The pull tabs at the tongue and heel made it easy to put on. A few buyers are already restocking the sneaker even if their current one is still usable in case Vans would discontinue to produce them. Although the fit is on point for most cases, several purchasers were disappointed that the sneaker runs narrow. Going half a size or a full-size up can provide the right fit. One user was annoyed that the foxing tape comes up high enough and would rub against his small toes which would sometimes cause blisters. Few buyers mentioned that there were no available sizes for them. Expanding the range of their shoe line, Vans came up with a sneaker that pushes boundaries. The Vans UltraRange Rapidweld is an all-around, lightweight sneaker that has a myriad of features packed into a low profile form. Its out-of-the-box durability can last without showing the impression of deterioration. Lots of users praised its exceptional grip and traction on various surfaces. Wearers that have wider foot conformity, though, might consider ordering half a size larger because of its slim construction. After decades of staying true to its roots, Vans realized that they have to expand their classic threshold and produce a sneaker that emits a sense of rad in all sorts of aspects. In 2017, Vans released their new shoe line called the Vans UltraRange which from the name itself, can be worn in a wide range of activities from trek trails to the office or from going bar-hopping to outrageously parkouring on streets. The concept of the shoe revolved around the idea that surfers, who are most inclined with Vans sneakers, needed an on-the-go shoe for all their activities and travels. As we all know, chasing the right waves and the decent weather is not a fixed phenomenon in this ever-changing world and surfers have adapted to that lifestyle. But this rigorous shift from soil to concrete cannot be withstood by an ordinary Vans Old Skool. The UltraRange does the trick. There are a handful of iterations in the UltraRange collection which include the UltraRange, UltraRange Gore, UltraRange Mesh, the Vans UltraRange Pro and the UltraRange Rapidweld. They expanded the range to cater to different personal specifications for a more intimate feel. 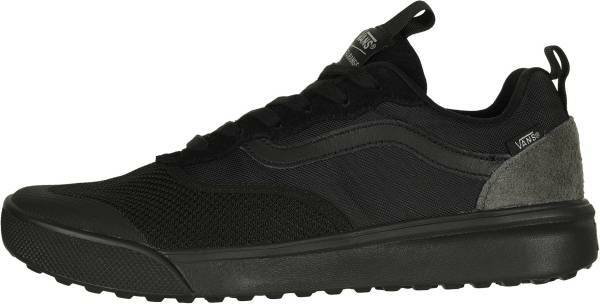 The UltraRange Rapidweld by Vans was the one responsible for the creation of other versions of the UltraRange. Its waffle lug tread is reversed to enhance grip and traction on different surfaces. Lightweight cushioning and comfort come from the UltraCush™ Lite foam blended with the LuxLiner Sock-fit construction of its interior that has zero seams to limit rubbing. The all-around sneaker was introduced to its silhouette-starved fans in February of 2018 which is almost just in time for celebrating Valentine’s Day. The moniker “Rapidweld” itself comes from the nature of the footwear’s construction which utilizes a stitchless assembly promoting flexibility. The bootie-construction also contributes in a significant way regarding its general lightweight. Approaching mid-2018, Vans replenished the Rapidweld’s grace in the footwear zeitgeist by collaborating with one of their in-house surf pros. The dainty Vans UltraRange Rapidweld oozes from the women’s-centric collection with Leila Hurst along with apparel and other footwear including the Sk8-Hi. The capsule was intended for the upcoming summer as accentuated by the palm-printed black dress which incidentally takes a nod to Hurst’s Hawaiian origin. A sneaker that is built in an all-around theme would inevitably coincide with almost every article of clothing. Whether it’s board shorts for beaches or pants for casual streetwear, the Vans UltraRange Rapidweld is designed to harness style in its low profile form. The Vans women’s UltraRange Rapidweld can be sported in sundresses and skirts too. With an Old Skool-patterned image, the sneaker proudly showcases the ubiquitous Sidestripe in emphasized tones. Welded overlays help obtain the sleekest appeal for the sneaker. The Vans UltraRange Rapidweld is a sneaker designed to tackle different scenarios around the world. Its unparalleled lightweight comfort is granted by the combination of an upgraded UltraCush™ midsole and a LuxLiner bootie construction that is created to fit like a sock with no seams for optimum pleasure. The sneaker maintains the standard lace fastening system of its predecessors. It is both available for men's and women's sizes in a wide range from 3.5 to 13 and 5 to 14.5, respectively. Both shoes are constructed in D medium widths. At first glance, one can notice the protruding reverse waffle lugs on the outsole of the sneaker. The Rapidweld upper displays a seamless, streamlined look with infused Sidestripe and overlays that retains the classic appeal. Mesh panels provide outright breathability that is complemented by the LuxLiner interior for a glove-like fit. The processing of the sneaker is also a new one for Vans as it is constructed with Pro Lite Vulc, a lighter alternative to standard vulcanizing materials. The sneaker utilizes water-based inks and glues adding an eco-friendly aspect to the shoe. The LuxLiner bootie construction has a seamless lining to reduce the weight, minimize rubbing, and eliminate hot spots. Other materials included in the sneaker are textile, suede, mesh, and synthetic components. The reverse waffle lugged outsole is co-molded to reduce the use of glue and radiate a pristine finish.